Woodland, four Metal-musicians from Lübeck (Germany) was founded in 2004. 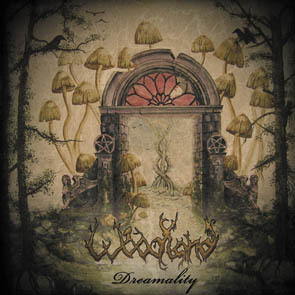 After a time of development WOODLAND finally found their own style to make music and are proud to represent their first album: Dreamality. By listening to the album you are taken to a long path through sagas, myths and dramatic narrations. It appears Cemenntie, a raging siren, who kills everyone who stands in her light. There is also a story about Violets destiny. A young women living in a world between dream, death and reality. You will meet bloodthirsty trolls, a less serious death nation army and sing at bonfire while the sun goes down an ode to Norway. But it's not enough to describe the music as “Metal”, its influenced by Folk, Death and Black Metal, Doom and smooth Progressive Rock. Very extraordinnary part of WOODLAND is the female voice of Koopie, far way from typical female metal vocals. The artwork was created by Othmar Krause (Mystic Art Galerie Lübeck).